Fun gets work done but what kind of fun and what kind of work? Humans are born with a desire to play but without a fully developed sense of humor. Learning to get from fun to humor helps us go from stressed to success. A thread of humor – the things in life that don’t make sense – is woven into the fabric of daily existence. In Fun Gets Work Done we remind each other where to look and how to respond -- we define humor within the comedy spectrum, illustrate through jokes and stories its instrumental use in effective communication, creative thinking, and problem-solving, and describe how it taps our potential to become whole beings ready and more able to help. Play that emerges from an appreciation and curiosity for the things in life that don’t make sense. What kind of work? : Drilling down to the nonsensical human core -- we’re not happy unless we’re helping; serving others serves ourselves. Fun helpers are more effective helpers. Being kinder to others begins by being kinder to ourselves. Humor enlarges our capacity --- we are humor sapiens. Laughter fills our cup so when we share our cup with another there’s more to give and more left for us, too. Thank you for your contributions to our successful 2012 TN Disability Mega Conference. We really appreciate the time and effort you put into your presentation. We wanted to share with you the evaluation feedback from your session: Fun Gets Work Done that you presented on Thursday, Keynote Breakout: 10:30-11:15. The scale was 0 (poor) to 100 (excellent 80-100). Your scores reflect the average of 17 evaluations. Please share this information with your co- presenters. • Brett Leake - Hysterical personal reflections. 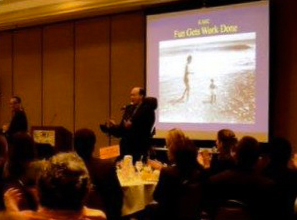 • Brett Leake was very humorous and the other individuals in the room also found him to be funny and enjoyable. • Brett Leake breakout - loved it! I laughed and cried. -- It uncovered the truth of daily living and how to help others. -- I like the chart analyzing the types of humor – It nicely captured the differences between humor, wit, and sarcasm. -- Entertaining but very useful – applicable to daily life and emotional balance. I could have listened for hours. The video above is a 9 minute speech summary from a presentation I made as a funny luncheon speaker for the Charlottesville, VA Chamber of Commerce.